This week’s Mascot Monday takes us back to Oregon. Last year we did Benny the Beaver, now we’re doing his compatriarte in The Oregon Duck. A much more successful compatriarte as well. While Oregon did its best in its first Rose Bowl appearance since 1995 this year, The Oregon Duck kept his tradition alive and kicking. We’ll learn the strange past of Oregon University as well as the even stranger links to Walt Disney. Plus, we’ll critique the tyke like we do with every furry costumed or live mascot. So come with us on a magical journey through an Oregonian wonderland. Qaucktastic! The early days of Oregon saw the students affectionately refer to themselves as “Webfooters.” The Webfooters originally were a set of fishermen in Massachusetts that helped then General George Washington fend of British soldiers in 1776. Their ancestors migrated west and took the name with them. The students eventually voted a version of the “Webfooters” name, Ducks, as their new nickname around the turn of the century. There was another fight to change the name in 1932, but the name stuck. 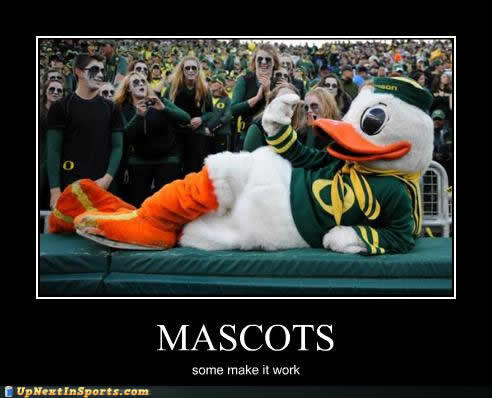 Oregon actually had a live mascot to begin thier tradition. In the 1920’s, a duck affectionatley named “Puddles” took to the road to support the sports teams. Much like the Webfooters ancestors of old, the ancestors of Puddle’s carried on the name at Oregon. It wasn’t until the Humane Society quacked enough in the 1940’s to stop the school from bringing live mascots to the game. Athletic Director Leo Harris had to think of something. It’s a good thing, both for this school and this article, that Harris was good friends with Walt Disney. On a gentlemen’s handshake, they agreed to use Donald Duck’s likeness as the mascot for the University of Oregon. Donald Duck in Disney lore is known for being scrappy and hot tempered. That temperament is perfect for a sports team. 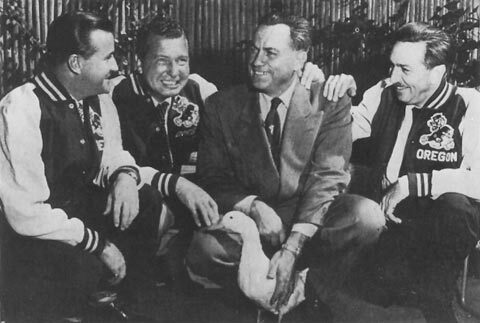 Walt Disney Productions tried to sue their way out of the deal in the 1970’s, but lost due to a photograph of Leo Harris and Walt Disney sporting Oregon letter jackets that had the logo plastered on the front. 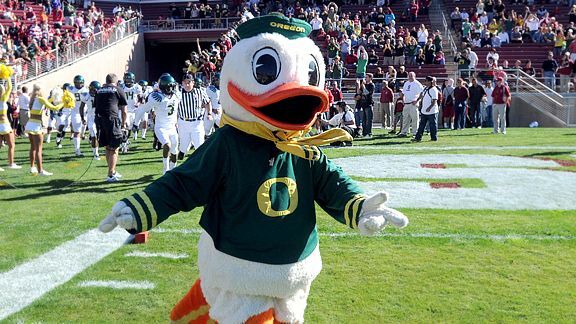 So let’s take a look at Donald Duck er… The Oregon Duck. It’s a duck. With a sailor cap and shirt. Okay, it’s Donal Duck. But instead of blue, he’s wearing green. Hey, it’s an old school cartoon character and he’s supporting a team. Plus, if you were looking for the ultimate in cartoony, then look no further than here. It’s a plush and fuzzy representative of the Disney corporation. When you wish upon a star, indeed. No, The Oregon Duck is not the best, but we think it’s pretty cool Oregon swung a deal with Walt Disney. The Oregon Duck goes to show that even though you may not look the best, if you got a cool story you will win the people’s hearts over. Sometimes that’s all you need to be a good mascot. We’ve seen some spiffy mascots that end up boring or had a history all of two years old. The Oregon Duck IS Donald Duck and Donald Duck IS The Oregon Duck. That’s all we need to give this guy a thumbs up.